Pilatus is displaying a full-scale fuselage and cabin mock-up of its new PC-24 ‘super versatile jet’ (SVJ) at Avalon. The company says it has created the new super versatile category for the jet as it does not fit into any of the current light or light-medium categories. “There was no existing category for the PC-24 so we made our own. It has the cost and economics of a light jet and the performance and space of a light-medium one,” Pilatus vice-president for the PC-24 program Andre Zimmerman told Australian Aviation at Avalon on Thursday. Pilatus has built on the success of its PC-12 turboprop, of which it has sold more than 1,300 worldwide, but has taken a clean-sheet approach to the PC-24. Zimmerman stressed that while it’s broadly comparable to the Citation XLS in size, the company “didn’t look at possible competitors”. Pilatus has taken 84 firm orders for the PC-24 including about 10 for the Australian market. The launch customer locally is the Royal Flying Doctor Service (RFDS), which has ordered three PC-24s for delivery from 2017. Pilatus CEO Markus Bucher told us: “It’s really brilliant that more than 10 per cent of the initial orders will land in Australia. On average, Australia is normally about five per cent of our market but the PC-24 will have a higher percentage share because of its unique capabilities. The first prototype began engine runs at Pilatus’s Stans facility in Switzerland in early February, where the Williams FJ44-4As were successfully tested to full power. First flight is due for the May timeframe. The PC-24 is 16.82m long, has a 17m wingspan and a maximum takeoff weight of 8,005kg. Importantly for Australian conditions the PC-24, like the PC-12 features strong short and unimproved field performance as standard, and can be optioned with additional landing gear and flap protection for gravel strips. Pilatus says the field performance offered by the jet opens up 185 per cent more airfields shorter than 950m in the Australia and Oceania region than comparable aircraft. 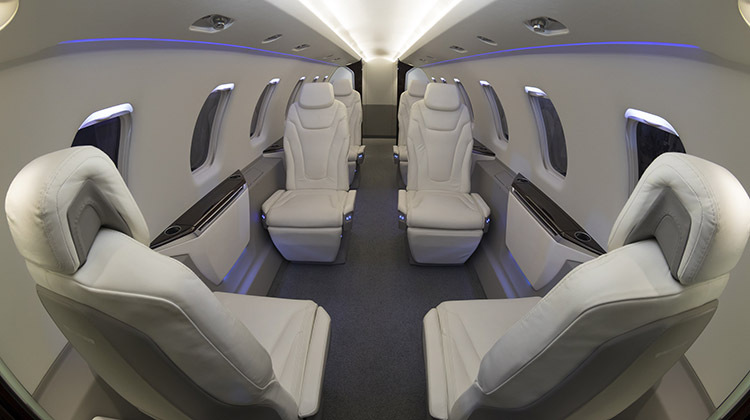 The PC-24 has a spacious 14.2 cubic metres cabin configurable with a six- or eigh- seat executive interior, a combi or all-cargo configuration, as a 10-seat commuter or with a customised air ambulance layout. To this end, the wing box is set below the fuselage and the cabin floor is flat, featuring multiple floor rails to enhance the interior’s flexibility. The cabin also features a big 1.3m x 1.25m rear cargo door as standard for the 2.5 cubic metres cargo hold, to ease the loading of outsize luggage, freight or stretcher patients. The PC-24’s cockpit features Pilatus’s advanced ACE avionics system and is single-pilot IFR certified. The aircraft is capable of missions of 3,610km at 425kTAS with four passengers or a 400kg payload and will be certified to fly at 45,000 feet.